For anyone following this blog, or following me on any other social media, you will have known that I spent about 5 days visiting the Setouchi Triennale. 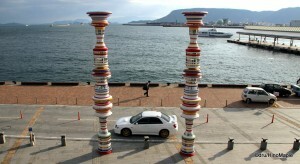 The Setouchi Triennale started in 2010 and the 2013 edition is the second year for this art festival. It combines both permanent and temporary exhibits in the hopes of revitalizing the local communities located on several islands in the Seto Inland Sea. Specifically, it is comprised of 7 main islands, 2 coastal communities, and 5 seasonal islands. 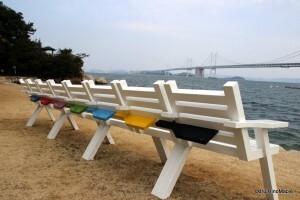 The 7 main islands were part of the original 2010 Setouchi Triennale along with Takamatsu. 2013 added the coastal community of Uno as well as Shamijima for the spring edition of the festival. I mentioned the basics in my preview of the Setouchi Triennale so I will refrain from describing things in more detail here. My own personal adventure started with a flight into Takamatsu in the afternoon followed by a night tour of the port in Takamatsu to get acquainted with everything. It had been about 4 years since my last visit to Takamatsu where I spent a day visiting Ritsurin Koen as well as a day out in Naoshima. I was inspired by that trip to make this trip work. I had my first taste of art in the Takamatsu Airport as they have a single art installation there. I then had another taste of the art at the port before getting some sleep. Each following day was an early day as getting to each and every island was an adventure in itself. Almost all of the islands were accessible only by ferry and it took on average 30 minutes to reach each ferry. There was a 2 day ferry pass which was very convenient. It allowed me to save a lot of money and see many of the islands at a cheaper rate than if I had gone to them without a special pass. Some of the islands didn’t require the pass but it really depends on how many islands you plan to visit and which ones you visit in order to make the 2 day pass work for you. Going to the Triennale required a lot of planning on my part to make sure I got the most out of the trip in the short time I had. On the first day, I did a half day tour of Inujima, famous for the Seirensho Museum and probably infamously known as the most difficult island to visit. With only 3 ferries a day, it was a challenge to wake up and get to the island and another challenge to figure out how the festival worked. Since it was my first day, I just haphazardly walked around the island trying to figure out the best route to take. I couldn’t find a few of the installations and couldn’t figure out why some places were stamped and some were not. I learned the hard way a day later that all of the installations have stamps and if they are free installations, they usually have a stamp located next to the art itself. I thought it was a little weird to see it but after inspecting it a little closer, I understood what it was meant for. I missed a couple stamps on Inujima but I can’t cry over it now. For the second half of the first day I went to Teshima and learned that my feet and my shoes would not be happy by the end of the trip. 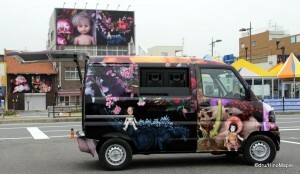 I took a bus out to the Kou district to see some of the art installations on the far side of Teshima. Since it was a slow yet quick bus ride through a valley pass, we decided to walk back to the main harbour. It didn’t hurt that we missed our bus and the next one wouldn’t arrive for about an hour and since it was a relatively short 3km to the main port district, we decided to have fun. We even reached our targeted bus stop just as the later bus arrived. Little did we know we would end up walking nearly 7km total for the entire day! Day 2 of our trip was the ferry trip. We started off with a half day in Teshima. Our goal was to start very early, head out to the Karato Port area and walk back to the main port, Ieura. We had no problems catching the first bus out the Karato and had time to explore the harbour and even went to a small tea house which was in a nice old lady’s house. 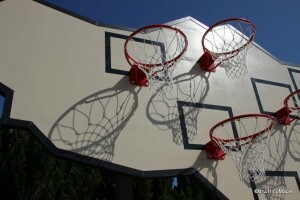 This was followed by a little basketball at one art installation and an interesting art house at the end of the beach. We then walked back to the harbour and took the bus up the hill to the Teshima Art Museum. It was really busy and not as enjoyable as I expected. I found all of the Bennese museums to be over rated and the smaller art houses to be more inspirational. It is just a personal opinion and not to say that the museums were not amazing. From there, we hiked back visiting various art installations along the way till we reached Ieura Port. We did get interviewed by a nice woman for Nishi-Nippon Television for their report on Teshima and the festival. I doubt I’ll ever see it on TV though but I would love to see it. I couldn’t answer every question but it was fun. After Teshima, we headed to Uno in Okayama. It is one of the main areas to access the various art installations but not as nice as Takamatsu. I met a really nice old man who was promoting the art exhibits on his own. I think Uno will be overlooked a lot by most of the visitors but Uno is worth a quick stop for a couple hours. The art itself was nice but the town surprised me because of the old man’s information. We mentioned we had 40 minutes to catch our next ferry so he gave us a short photo history lesson of the area for free. Uno was the main port for train traffic to and from Shikoku. Before the Seto Ohashi was built, Uno was a thriving port town. They had a huge train yard where train cars were loaded onto ferries and then shipped over to Shikoku. Today, Uno is a shadow of its former self with nothing to really promote aside from a small ship building industry located near the main commercial port. The final tally for walking for day 2 was 9.84 foot blistering kilometres. Day 3 was one of the most relaxing and one of the most eventful days of my trip. We started with the morning ferry to Ogijima where we just toured the entire island. It is a very quaint little island with little to do and a very laidback atmosphere. It is a very hilly area and all of the art installations were very close to each other. On the second day, we learned that a lot of the “roads” printed in the guide book was more alike a small path between homes which made reading the map a little difficult. There were points where they said there were steps on the map but the steps literally went into the corner of a house! They had no real reason to be there or even on the map as it looked like stairs built for the owners only, but they were in the map. The real misadventure happened when I misread the departure time for our ferry which ended up with us having a 2 hour wait for our next ferry. It was okay as we were really enjoying our coffee break at Onba Factory and Café. The people were really nice and the view of the port was excellent. I would love to have spent a lot more time there but I didn’t feel like returning after missing the ferry. For the 2 hours remaining, we headed out to the lighthouse, about 2km from the port and I built my own Inuksuk on the beach. I just hope it is still there, but who knows. I might return in 3 years and if it is still there I would be very surprised. We then headed to Megijima for a fast tour and spent a bit of time just hanging around the port. I found Megijima to be a little less interesting compared to Ogijima but it could have been due to the rushed nature of my time there. I expected to spend a half day there rather than a couple hours, but that is life. I will be back again someday. For day 3, we did another 10km of walking which helped drain our energies and make continuing the tour harder and harder. Day 4 was Naoshima. Being a Sunday, we had no choice but to visit Naoshima on a weekend because Naoshima’s museums are closed on Mondays. We took off on another early morning ferry and started our hike around the island. We decided to take the direct walk to the Chichu Museum. We didn’t know it at first but we should have gotten numbers so that we could enter the museum earlier but we didn’t. We ended up walking around the museum district in an inefficient manner but having fun at the same time. After a long time in the Chichu Museum, mainly due to the lines to see the exhibits, we headed to the Lee Ufan Museum before walking all the way to the famous pumpkin near the beach. We took a bus from the Benesse area to the Honmura Village where we looked at a couple new museums. We went to the Ando Museum and the Hiroshi Sambuichi exhibit. I was surprised by these museums as it provided a lot of insight into these two famous Japanese architects and their thinking into design. I didn’t visit the art house projects on Naoshima as I had done so before, so instead we hiked back to Miyanoura district to relax before our ferry back to Takamatsu. While the day was spent at the public art works, most of it was walking and exploring the island on foot rather than by bus, which we did 4 years ago. Naoshima’s walking total was about 12.4 km. All of this walking led to the ultimate decision to cut a day off of our travels to the Setouchi Triennale and leave Takamatsu on the next day. The last day of the festival was a half day tour going to Shamijima, a small island located at the base of the Seto Ohashi. Shamijima is a spring only festival but I suspect some of the installations will be permanent. It is the most accessible “island” as the island is connected by a land bridge. Bus access is fairly frequent and there is a lot to do in the area. I didn’t want to spend too much time there but I did see all of the art exhibits. One of the exhibits was placed in a school and combined several different works by different artists. It was a joy to see all of it and it was one of the more thought provoking areas of the festival. It was also where I could enjoy a nice “art soup” put on by “EAT&ART TARO”. They had a “Millennium Soup” that was created from a recipe that was originally created about 1000 years ago. It was not cheap but it was part of the spirit of the festival and it was made by the obachan of the area so I couldn’t say no. While I wouldn’t have the soup every day, it was a nice meal to have and I don’t regret having it. Thankfully being a half day, I only did about 3.5km of walking, but since the day and trip wasn’t over, I still had a lot of walking in Okayama before the trip was finally over. That’s it for this summary of the Setoushi Triennale. There is a lot more to tell and I will be writing a lot more about it in the coming months. You will have to bear with me as this blog may become more of a Setouchi blog than a Japan/Tokyo blog. This post will also collect all of the pages for easy reference. Dru’s Great Setouchi Triennale 2013 Misadventure is first part of a series of posts on the Setouchi Triennale. Follow the links below to read more about the different aspects of the Setouchi Triennale. 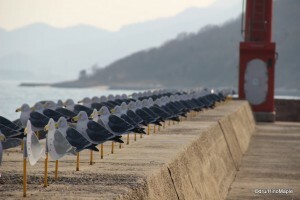 This entry was posted in Chugoku, Setouchi Triennale, Shikoku and tagged art, art festival, Ieura Port, Inujima, island, japan, Kagawa, Karato, Karato Port, Kou, Kou Port, Megijima, Naoshima, Ogijima, Okayama, Onba, Onba Cafe, Onba Factory, Seto, Seto Ohashi, Setouchi, Setouchi Art Festival, Setouchi Triennale, Takamatsu, Takamatsu Airport, Takamatsu Port, Teshima, Triennale, Uno, Uno Port by Dru. Bookmark the permalink. I enjoy reading about a visitor’s personal experiences/thoughts rather than esoteric pontifications about modern art. Trust me, I have written a LOT already. Finished 3 islands and have 3 more to go. Need to proofread and get photos for them, but next week will be the first post. I estimate around 13 more to be published by summer. Yikes! Is it some sort of trip plan for the summer/autumn? I’d love to hear about that too. 😀 I did stay in the Takamatsu Terminal Hotel. Just a block or so from the station. Paid about 7500 a night, but had an expensive night on the weekend. Typical weekend mark-up. Functional hotel with good washrooms. Not as small as other places. And thank you for supporting those communities. I would like to visit the islands some day. I hope you can visit those islands. I plan to do the Shimanami Kaido someday. Maybe next year as I have an annual adventure to do. First of all, thanks for the shout-out and I’m glad you enjoyed your time in the area. Indeed, while I’m slowly approaching the double digits for most of the islands in terms of number of visits, my very first visit to Inujima was last week after several failed attempts in the past three years. Yeah…. Walking through Teshima is a good idea if you have a few days to rest afterwards. Otherwise, I wouldn’t advise it. I can’t imagine the Teshima Art Museum busy. This place is one of the most amazing building/site/place I’ve ever been to, I mean it. But the lesser people in it, the better. Last time I went – last October – we got lucky enough to have it all for ourselves (we were the last visitors of the day). An unforgettable experience. I need to write about the inner workings of the Festival as I start to learn a bit more about them (not a lot yet), but yeah, basically some of the art (on all of it on Naoshima and Inujima, some of it on Teshima) is managed by Benesse Art Site, while the rest (on the other islands basically) is managed by Fram Kitagawa and ArtFront Gallery, and I usually find myself liking the ArtFront Gallery more than the Benesse things (that being said, I’m a huge fan of Teshima Art Museum and Seirensho Museum, both of them are Benesse as well as Shima Kitchen – not sure who manages it though). I think that’s one of my favorite things about the Triennale, more than the art, it’s the interactions with the local people. Not necessarily, a lot of people (especially those on a short trip from Honshu) arrive at Uno (and then go to Naoshima). I have yet to go this year though. I guess I’ll go in the Summer or the Fall. That’s because you need a very precise map not to get lost in Ogicho, especially if it’s your first visit (I think that I’ve started to know my way around the village only for my past two or three visits there). Indeed. This is the whole point of the festival. I hope not too many people miss it. Can’t agree more. My experiences in 2010 are one of the reasons I decided to move here. Yeah, I would normally recommend a rest after walking through it, but I had no choice. Hotels are not cheap and time was limited. If I had more opportunities like you, I’d go every weekend. It was busy. I had to wait to enter because they were limiting entry. It wasn’t so busy that I couldn’t enjoy it, but I felt it wasn’t as enjoyable as if I had it to myself. You were pretty lucky to go on your own. I did like Seirensho, but I appreciated it a lot more after visiting Naoshima Plan. I wish I knew more about Seirensho before I visited to appreciate it more. I was also a little sour by the fact I had to pay for the Benesse museums (Teshima & Chichu) but it is within their right to ask for payment. Just not sure it is worth the regular price though. If it is true that the other islands had a different curator, it makes a bit more sense. However, I am more a fan of the small/interactive houses than the bigger ones. Just a personal preference. I agree. Interacting with people is very important. My reasoning, it is more likely people will stay in Takamatsu. Unless you live near Okayama or in that area, you wouldn’t really go. Although people could go to Takamatsu via Uno, I just don’t think it is that economical or reasonable. I hope I’m wrong because everywhere was fun.